Welcome to the Efficas for Asthma Healthcare Professionals Section. If you have any questions or would like to trial Efficas for Asthma, please call us toll-free at 1-866-446-0388 or click here to submit an inquiry. Efficas is not your typical nutraceutical food, we spent years developing efficacy for our formula and process. We have case studies and clinical trials we’ve completed on the product which is available upon request. Efficas Care is a specially-formulated medical food for the dietary management of asthma. This proprietary blend of two naturally occurring essential fatty acids (GLA and EPA) is clinically proven to safely and effectively inhibit the production of leukotrienes, substances known to cause the inflammation prevalent in asthma sufferers. Learn more about allergic diseases and leukotrienes This formulation blocks the synthesis of leukotrienes by altering the pool of fatty acids (AA, GLA, DGLA, EPA). Sufficient quantities of essential fatty acids, gamma-linolenic acid (GLA) and eicosapentaenoic acid (EPA), necessary to alter the pool and inhibit leukotriene production, are not available on a normal diet. Efficas Care meets FDA standards for medical food ingredients and has been rigorously tested and proven effective in multiple clinical studies. When taken once a day as part of the daily diet, Efficas Care helps relieve asthma symptoms and improves the quality of life for those who suffer with them. Efficas Care is a novel dietary management product for reducing leukotriene production. Clinical studies with people who suffer from asthma demonstrate that Efficas care reduces leukotrienes. Consumer studies demonstrated that asthmatics slept better, experienced less wheezing and shortness of breath, and engaged in more physical activities. The medical food Efficas Care and its ingredients have been tested for efficacy, safety and bioavailability in six clinical studies. Combining ingredients from nature to bring relief. Borage oil, fish oil (anchovy, sardine), purified water, fructose, natural flavors, lecithin (soy), guar gum, xanthan gum, polysorbate 80 (emulsifier), sorbic acid, and ascorbyl palmitate. Note: Due to the natural blend of essential fatty acids present in high-quality wild fish oil, each packet also contains approximately 350 mg of DHA. 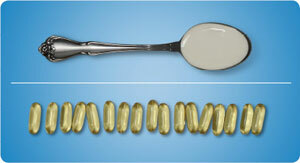 We recommend that the Efficas Care products be your only source of supplemental DHA. See Nutritional Label here. Efficas for Asthma is a novel dietary management product for reducing leukotriene production. Clinical studies we’ve performed over a number of years with people who suffer from asthma demonstrate that Efficas care reduces leukotrienes. Consumer studies demonstrated that asthmatics slept better, experienced less wheezing and shortness of breath, and engaged in more physical activities. Our product and its ingredients have been tested for efficacy, safety and bioavailability in six clinical studies. The GLA and EPA in Efficas Care are emulsified, which means they are made into very tiny particles. Clinical studies showed significantly enhanced bioavailability of GLA and EPA when consumed in the emulsion formulation compared with consumption in soft-gel capsules or liquid oil forms. 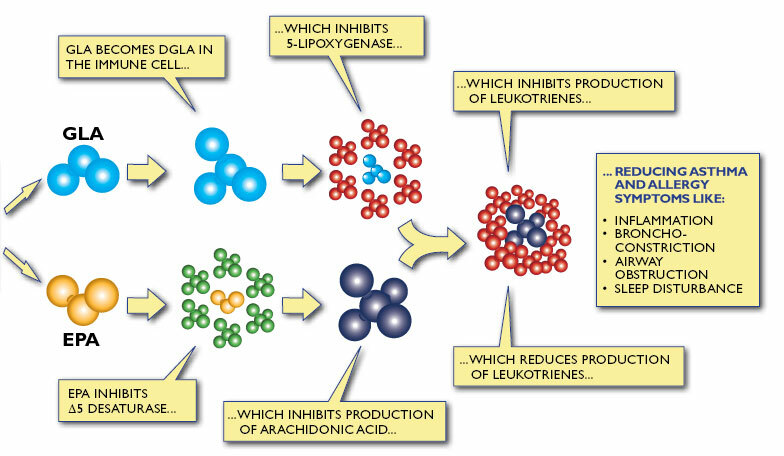 Enhanced bioavailability means that a lower dose is required for optimal benefit. It would require 17 one-gram gelatin capsules of oil to deliver the effective amount of GLA and and EPA found in a single Efficas for Asthma tablespoon – the daily amount needed to help manage asthma symptoms.